As if to mark the passing of spring into summer, every year the mirror-clear surface of the St. Croix River separating Minnesota from Wisconsin turns dull as a slimy green sheen overtakes it like a shabby coating of tinted plastic wrap. Likely a result of runoff from the agricultural lands surrounding the river, these algal blooms shut down beaches, denying schoolchildren newly free for summer break from one of the few amusements in the sleepy towns surrounding the river. At the camp I attended for 10 summers, we swam in it anyway, the algae staining green polka dots into the lining of our swimsuits. Algal blooms come in a rainbow of colors, caused by a slew of algae and bacterial species that multiply exponentially with enough sun, slow-moving water and nutrients like phosphorous and nitrogen that commonly come from fertilizers, wastewater and fossil fuels. While most are merely inconvenient and kind of gross to humans, some blooms can cause neurological complications, respiratory problems and rashes. And they’re even worse for wildlife. Algal blooms can eat up the oxygen and sunlight in the water, creating dead zones that kill fish, plants and other marine life. 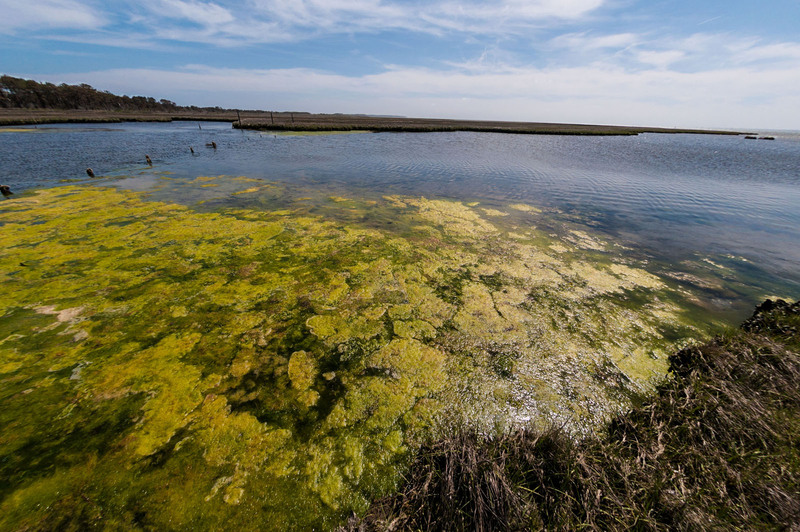 The National Oceanic and Atmospheric Administration estimates that harmful coastal algal blooms cost the U.S. economy $82 million per year by negatively impacting recreation, tourism and the seafood industry. And their effects will likely worsen with climate change, according to the U.S. Environmental Protection Agency. One way of preventing algal blooms is to go right to the source: fertilizer runoff from farms. John Miller, a chemist at Western Michigan University, and his team presented research at the American Chemical Society meeting on March 25 that aims to give nutrient scrubbers to farmers on the frontlines. These scrubbers provide a home for algae and bacteria to thrive on the fertilizer nutrients right where the runoff starts, before it reaches major waterways. The algae grow on screens with the water flowing through them, leaving the water less polluted than when it entered. The growing algae can then be harvested and used to make biofuels, and what’s left over after that process can be spread back onto crops as fertilizer. Miller’s group is now 3D printing scrubbers in the lab that are specifically designed to foster algae growth. Similar clean-up efforts have been in development on a large scale since the 1980s and have proven effective in Florida, Popular Science reported, but this would be the first small-scale attempt that could work off the electric grid — a must if it’s going to be used in farm fields. The cost is unknown at this early stage, but these smaller scrubbers will likely be much cheaper than the massive scrubber operations in Florida and elsewhere. Miller and his team are still refining their technologies in the lab, but plan to have them in the field soon. Hopefully their scrubbers can save some sea life — and summer camp swimsuits — from an untimely algal death. What about bubbling CO2-ladened fuel from power plants etc through the water to grow the algae faster while converting the CO2 to O2? Wouldn’t this be a way to get rid of the CO2 while producing a usable fuel? Perfect, just what we want!